Marty (and my ensuing mule obsession) came into my life five years ago, on April 13th 2014! I’m very glad he did, although there have certainly been times when I’ve raged, cried, and tried to sell him. We’re in a pretty good place right now, but I haven’t forgotten the difficulties we had to go through in order to get here and I won’t take what we have for granted. 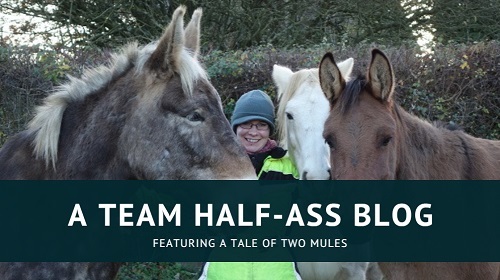 What do the mules think of … being able to compete in British Dressage? A week ago, Wallace The Great made history by becoming the first mule EVER to compete (and win!) in British Dressage. It's been absoloutly fantastic to see the increased interest in mules following his achievement – they deserve to be recognised!Anyway, some of us may have got carried away by the whole excitement of it. Here is a stupid video what I made. 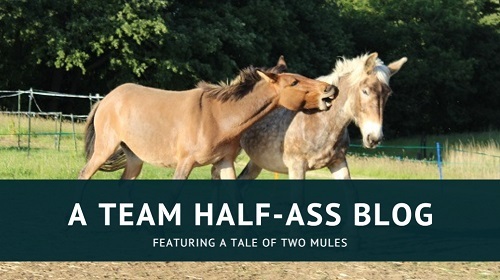 Mules learn by watching others, right?